The next meeting of the Ulysses Reading Group is on Sunday 21 October 2012 at 7.30pm in Muir Court. We are starting a new episode this time, episode 15, corresponding with the Circe episode in Homer’s Odyssey. Circe was a sorceress who could turn men into swine. 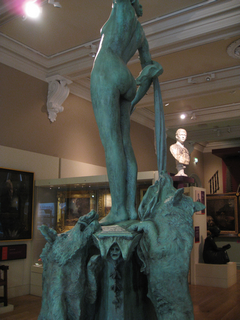 Leeds has its own statue of Circe by Alfred Drury dating from 1894. It is now housed in the museum but stood for many years in Park Square.